SKU: FLTRL-1QT. Categories: Interior Finishes, Stain Additives. 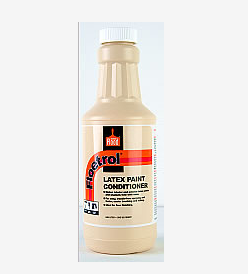 Tags: Acrylic Latex Stain Conditioner, Floetrol, Paint Conditioner, Stain Conditioner. WHAT IS FLOETROL STAIN CONDITIONER? WHAT ARE THE ADVANTAGES OF FLOETROL STAIN CONDITIONER? Minimizes brush and roller marks to make your stain job look better with less effort. Gives latex stain the flow and leveling of oil stain to enhance its performance in less-than-ideal circumstances. Maintains and fortifies the qualities of stain.· Improves the coverage of most stains while providing an exceptional value for the money. Gives you time to create the look you want or to correct the mistakes you’ve made. Reduces tip clogging and piston freeze-up with cup-gun spraying-guns last longer. Permits 20% lower spray pressure when spraying. HOW DO I APPLY FLOETROL? Mix 1 quart of Floetrol per five gallon pail of Lifeline Interior. Let the stain’s work-ability be your guide as to how much Floetrol you need. Do not add more than 5 quarts of Floetrol to a five gallon pail of acrylic latex finish. Tip: When adding to a cup-gun, if the stain seems to thicken, stir in up to 1 tablespoon of water to thin the stain. For more information, see the Floetrol container. WHAT COVERAGE CAN I EXPECT WITH FLOETROL? Coverage of Floetrol will vary with use. HOW DO I CLEAN UP AND STORE FLOETROL? Clean up tools with soap and water. The Floetrol container is completely recyclable for safe, environmentally-friendly disposal. Avoid excessive heat or cold when storing. Do not allow to freeze! HOW DO I ORDER FLOETROL? Be the first to review “Floetrol Stain Conditioner” Click here to cancel reply.